Do you like crunchy-shell tacos or soft tortilla tacos? Our family’s standard tacos usually involve crunchy shells, spicy beef, refried beans, cheese, and lettuce. They are tasty, but sometimes Leah and I like to mix things up a bit and branch out! This past Saturday we were in the mood for something light, fresh, and quick to make in between doing the mountains of homework we have to do this weekend (got to love school!) . We came across these tacos and were sold. 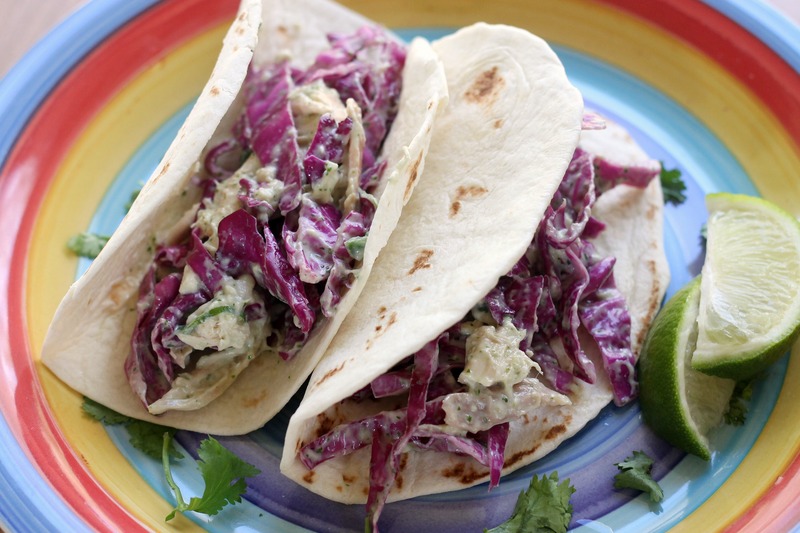 The contrast between the soft tortilla, roast chicken, creamy dressing, and crunchy cabbage and jalapenos is delightful. These tacos are anything but boring and much more suitable for spring than our normal family favorite (and also a bit healthier). The only thing we can possibly think of adding in the future is avocado sliced over the top (and maybe a little more chicken), but honestly, these are great on their own! In a blender or the bowl of a food processor, add the cilantro, sour cream, lime juice and olive oil and puree until smooth, scraping down the sides with a rubber spatula as needed. Season with salt and pepper to taste. Transfer the cilantro cream to a large bowl and toss in the red cabbage, jalapeños, and scallions, coating everything well with the cilantro cream. Let the cabbage mixture stand at room temperature for 15 minutes, until the cabbage just begins to soften but still has a bit of crunch to it. Add the chicken to the bowl and with a pair of tongs, toss the chicken into the cabbage until it is well-coated with the cilantro cream. Season to taste and serve in warm tortillas. Top and garnish as desired. Enjoy! Side note: To warm the tortillas, wrap them in foil and bake at 350 degrees for about 5 minutes or so. 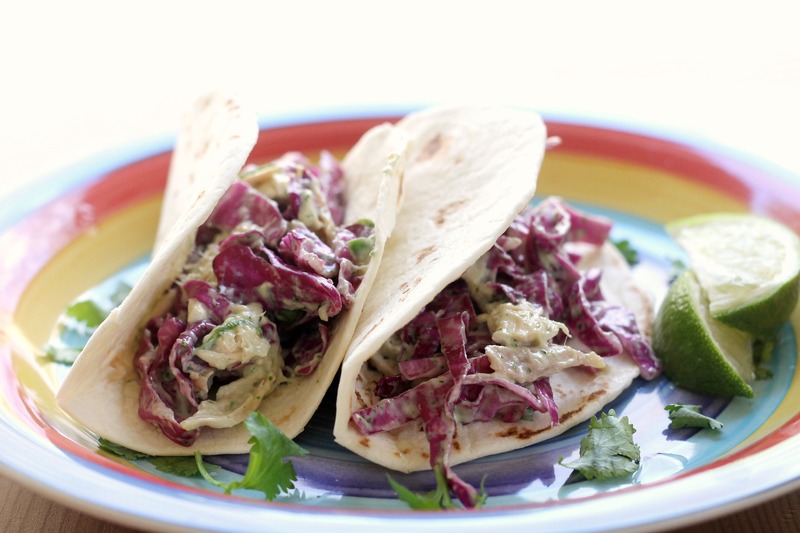 We loved these tacos, and your blog! All of your recipes are a big hit with our family!